Janis Graves is a native of Washington State. Since childhood her world was one of colors and textures. From the moment her father showed her the nuances of color in a dog-eared coloring book, she never lost interest in trying to capture the superlative beauty in her everyday world. After high school she moved to the eastern town of Walla Walla, Washington and began to raise her family. The raising of her children became her focus but even in that she found art never far away. Seeing through young eyes gave her new perspective. After two decades of growth with her family, Janis has been free to devote to her art. Pastels have become a special love. She has worked in both acrylic and oil, and still enjoys both mediums, but has found nothing more immediate or vibrant as pastels. In the development of her skills Janis has taken classes at the Seattle Academy of Fine Arts. She has had the pleasure of attending workshops with a wealth of well-known artists such as Ned Mueller, Richard McKinley, Bill Hosner, Jennifer Deihl and Susan Ogilvie. She continues to meet on a weekly basis with a fine group of pastel artists that provide both insight and inspiration. Janis is a member of Artists Connect, Women Painters of Washington and a signature member of the Northwest Pastel Society. 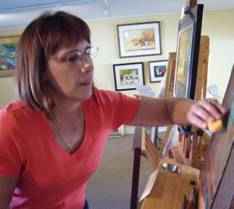 Her works have been seen in several galleries such as the American Art Co, Tacoma; Scott Milo Gallery, Anacortes; Clymer Museum of Art, Ellensburg and Wild Horse Gallery in Bellingham. Janis was chosen to jury the “Arts on the Terrace 2009”. The pastel “French Countryside” was selected for the label on Emma Brie Cheese of Canada. “Sunset Reflection” can be viewed on the WA State Ferry Cathlamet.